Crickets.. The true definition of PEST! With their “soothing” chirping and speedy hopping these insects may be an intimidating encounter however, none of our species bite or are likely to carry diseases. Arizona serves native to several species of cricket however, only two are generally seen. This common intruder feeds on a wide range of food sources and can damage fabrics, leaving the surface roughened from pulling or picking the fibers loose while feeding. Yellowish/brown or tan in color with darker bands and spots, 1 inch long when mature; these are the “house”crickets. Nesting along foundations and doors outside and readily come indoors through cracks or openings. They are the only type of cricket that live and produce eggs indoors. This pest is nocturnal, hiding during the day and coming out at night to feed on crumbs, pet food, and plant debris. Living in crevices and cracks, piles of black/brown sand like droppings may be seen outdoors under siding and near door jams. Measuring larger than Indian house crickets (slightly more than 1 inch when mature) dark brown to shiny black color. 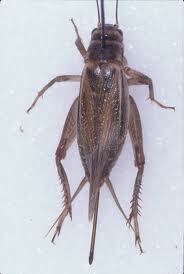 Dont let the name fool you.. Field crickets also enter houses and buildings. Occasionally they invade homes in search of hiding places but do not produce young indoors. These crickets prefer to live and reproduce outdoors where they feed on plants and cause damage to young garden plants and annual flowers. 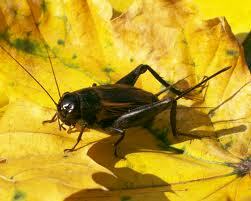 Field crickets are known to chew on and damage woolens, cottons, silks, synthetic fabrics, furs and carpeting. Clothes with sweat stains or stains from food are particularly attractive. Tride and True is equipped for your cricket concerns, using only the safest, most current pesticide techniques targeting entry points and harborage areas as method of basic pest control. Use caulking and weather stripping to fill all holes, cracks, and gaps in foundation, siding, windows, doors, screens, and other possible entry points. Remove plants/debris that could serve as hiding places or breeding sites near 1foot from the house. Make sure all doors and windows are tight-fitting. Maintain the outdoor watering system, try not to over-water grass or allow standing water near the home/structure. Talk to your Tride and True Pest Pro about control measures and services during summer and winter months.